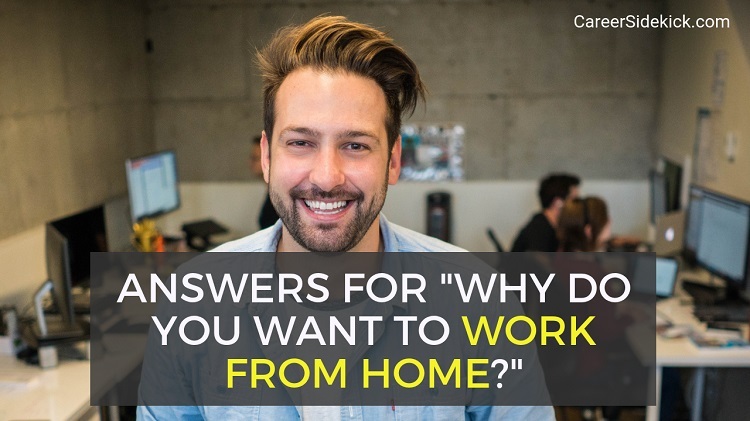 If you’re interviewing for a remote job or work-from-home job, you’ll need a great answer for the “why do you want to work from home?” interview question. You’ll also need a good answer for this if you’re asking your current employer for permission to work from home. Any time you’re answering this question in a job interview, there are some steps you want to follow. Even if you’re interviewing for a job that’s fully-remote already, you’ll still need a great explanation for why you want to work from home… because this is going to be one of the top interview questions they ask you. No dress code (unless you’re getting on a video call)… No commute… More time to sleep. You can be home to get deliveries, talk to repairmen, etc. Life is just much easier when you work from home. But if you want the interviewer or hiring manager to say “yes” when you ask for this perk, you’ll need to give a good business reason for it. You could say you’re able to get far more work done in a distraction-free environment, and when you don’t need to spend an hour commuting each way. That’s one way to twist a personal reason (skipping the commute) into a business reason. If your commute is very long, you can point at the amount of time you spend in the car or on the train each day and talk about how much more productive you’d be if you put that time toward planning your day and doing work. That’s just one example of how to do this. Get creative, and remember to always mention one business reason and one benefit to THEM. Don’t just talk about yourself when answering this question. Always make sure you’re talking about their needs and how this can help them. If they ask you why you’d like to work from home and you’re only talking about yourself and what YOU want, then you’re really not answering this question the right way. As an employee, you want to be showing the company that you’re thinking about ways to produce more work for them. Your manager will LOVE this if you make your answer about them. Rather than trying to twist an employer’s arm into giving you this perk… think of it as a conversation to come up with an arrangement that both sides feel is fair. Negotiation expert and former FBI hostage negotiator Chris Voss wrote an outstanding book where he talks about how “no” is the beginning of a negotiation, not the end. So if an employer says “no” at first, don’t feel defeated. You could ask an open-ended question to understand their objection to you working from home. Open-ended questions like this are a great way to find out what the other person is thinking in a non-confrontational way. FYI this is one of the best interview tips to follow in general. It really is just a conversation! In this case… asking this will also help you find out if you’re hearing “no” because working from home regularly is against company policy. Some companies just don’t allow employees to work from home, so it’s better to find out early in the process if this is something that’s important to you. While it’s good to be honest and admit you’re really attracted to a position because it’s work-from-home, you should also make sure you have other reasons for wanting the job. Show interest in the position itself at least as much as you show them you’re excited about the idea of working from home. I’ve interviewed for fully remote jobs in the past and tried to act like I wasn’t excited about working from home, and the interviewer knew I wasn’t being honest. It cost me the job! So don’t lie or hide your excitement; just make sure to show equal excitement and interest in the position itself. Do your research, know what the job involves, and be ready to name a couple specific reasons why you want this position. One way to do this in the interview is to ask the interviewer lots of great questions about the company, the team, and the position. Practicing your answer will help with this. Also, try not to act like this is a big deal or a huge life-changing thing. While working from home might be your dream and really WOULD change your life in huge ways, you want to act like it’s just a casual, reasonable request that you feel would benefit your productivity (or whatever other business reason you’re going to name). So try to stay calm and level-headed when you ask. Don’t act like it’s a huge letdown if they say, “no”, and don’t go crazy celebrating if they say, “yes”. By asking calmly, you’ll be more persuasive, you’ll seem more professional, and you’ll be more likely to hear the answer you want from them. If you don’t hear “yes” after following the steps above, you could suggest doing a trial period so that if it doesn’t work out, you can return to the office. Or you could suggest trying two or three days per week at first, rather than all five. There are many ways to move toward your goal of working from home if you’re willing to talk to the employer, understand their viewpoint, and use logical business reasons as much as possible. Or if you really like the job, you could start out in the office and then demonstrate you’re capable of working at home little-by-little. For example, you could tell your boss you have a repairman coming or are expecting an important delivery you need to be home for, and you don’t know what hour it’ll arrive. Ask to work from home and then go above and beyond what they expect in terms of your work. Get double the work done compared to what you normally would! Then a few months later, bring up the conversation of working from home on a regular basis! If you’re planning on asking to work from home in your next job, you should really use the whole hiring process to show you’re a self-starter… even before going on an interview. Respond to emails quickly and clearly. Show you can communicate effectively. If you are calling the employer or returning their call and you don’t reach them… suggest future times to speak in your voicemail. And/or follow up by writing an email with your availability for the next day if they tried to reach you but failed. While avoiding phone-tag might seem like a pretty small thing to do, it actually goes a long way toward showing the employer you’re capable of working on your own and getting the job done. You’d be amazed at how many people can’t even communicate clearly to set up a phone interview. For example, they won’t tell an employer what timezone they’re in. Or they’ll call back and not leave a voicemail with any future availability, etc. Another opportunity to go above and beyond what they expect with communication: Thank you emails and follow-up emails after the interview. Small things like this add up and show an employer you’re competent and a far-above-average communicator. Your request to work from home is NOT going to come out perfect the first time you say it, especially with the interviewer or your boss staring you down. So practice at home and make sure you’re comfortable with what you want to say. Also prepare for what you’ll say if they say, “no”. We covered a few ideas above including suggesting a trial period, suggesting a couple of days per week to start, etc. By having a plan for if they say, “yes”, but also if they say, “no,” you can continue the conversation and get the best possible arrangement given the situation. If you follow these tips, you’ll give yourself the best chance of success when asking employers to work from home, and answering “why do you want to work from home?” in your interviews.